During the month of February youth can join in the various activities planned through Break The Cycle and Let’s Be Real. WRC will host a Valentine’s Day Making and Movie night on February 14th for 12-18 yrs old. Details on our event calendar. 1 in 3 Teens will experience some form of abuse in a dating relationship. As the adults in their life we need to be in their network of people who are there to support them and to listen. As a parent you can participate in It’s Time to Talk on February 1st an awareness event to bridge the gap between generations and generate conversations about healthy relationships. You can find some suggested conversation starters on our previous blog here. 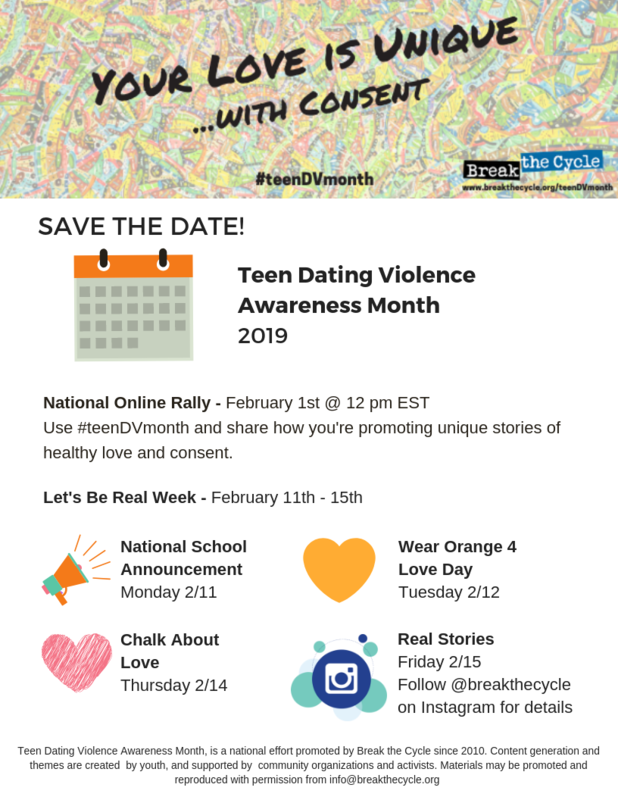 WRC will be using social media to highlight stories about youth experiencing domestic violence and sexual assault, youth activist and the work they are doing, and healthy relationships. WRC’s Outreach Coordinator and Community Educator will be participating in resource fairs and presentations throughout the month. If you are looking for someone to speak with your group inquiries can be made on WRC’s Contact page.